December 5, 2011 December 6, 2011 - by Lauren Michael - 19 Comments. In 1992, Holly Collins went to a Minnesota family court intending to secure full custody of her two children, Zackary and Jennifer. She had believed that if she told the truth–that her ex-husband had repeatedly abused her and their children–everything would be okay. But her evidence of abuse, including several medical records and the children’s statements that they always feared visiting their dad, were repeatedly rejected by the court. Her husband claimed she was lying and trying to alienate their children from him. 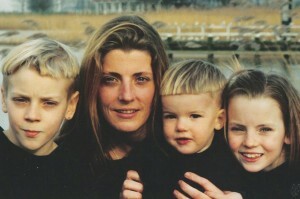 Then, like thousands of battered women each year, Holly lost full custody of her children to their abusive father. After two years with limited supervised visitation, in which the children weren’t permitted to discuss the ongoing abuse, Holly decided to do something. One day, she asked her kids to meet her at a video store near their dad’s house. They got into a car and started driving. They tried going to Canada, Mexico and Guatemala. Knowing the FBI was searching for them because Holly had in fact kidnapped her kids, she decided to try escaping to Australia or New Zealand. They managed to sneak through airport security without passports and got onto a flight to Amsterdam. There, they were detained and sent to a refugee camp. Years later upon finding a lawyer willing to take her case, Holly became the first U.S. citizen to be granted asylum by the Netherlands on the grounds of domestic violence. For COM Professor Garland Waller, Holly Collins’ story was the perfect outlet for her to make a documentary on the shortcomings of the American family court system. “My first documentary was about three women who all lost custody of their kids to men who had battered them and sexually abused them,” she said to me when I interviewed her last Thursday. The documentary was never aired for the public, however, because people considered it way too controversial. “I thought, I know this is an issue that is going on in the family courts, every single day,” Professor Waller explicated. “How can we do a story on this issue of domestic violence and child abuse that people will want to see; that will have a story that has a beginning, middle, and end; that has a hero; and that doesn’t make them feel suicidal at the end?” That’s why she decided to center her film around Holly’s story. “Holly is one of the few women who has been able to save her children from years of being abused,” she affirmed. 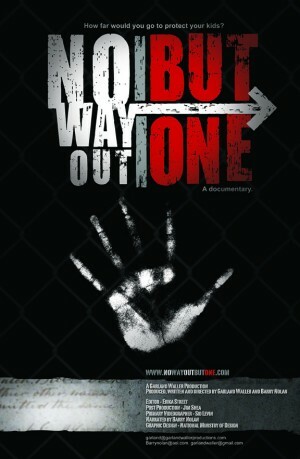 On December 2 at 7pm in COM 101, Professor Waller and her production team screened the film No Way Out But One for a packed lecture hall of students and faculty. The hour-and-a-half long documentary, which was followed by a Q&A session, follows Holly’s story and also outlines the grievous problems 0f the American family court system. Made for under $40,000, the not-for-profit film was a way for Professor Waller and her husband Barry Nolan (who also produced and narrated the film) to make a difference. As the documentary cites, each year 58,000 children are placed in contact with an abuse parent after divorce, and batterers win custody in 70% of family court cases where abuse is involved. Professor Waller also cited the lingering gender bias in the family courts. “Courts do not have to consider domestic violence in their rulings, ” she said. “Now that is anti-woman, because it’s usually the women who get beaten up.” Money, she says, is also involved. “The men who want custody are the ones who can afford to have the kids, and you have to be able to pay the court costs,” she explained. “This is something that doesn’t happen in poor families…it costs hundreds of thousands of dollars to pay all these people.” If the father is paying for the court evaluator, she says, often they’ll skew the evidence in his favor. Since the release of No Way Out But One, Professor Waller and her husband deal with angry father’s rights groups every day. These groups, like Fathers and Families, make an impassioned–if not entirely factual–argument for why they believe the Holly Collins case is a hoax. “After a nice review in a Boston Magazine blog, many pro-father’s rights men were highly critical,” she explained, but “none of them had seen the film and none of them had access to all the thousands of pages of legal documents and medical records and correspondence from experts and FBI documents that we had.” Many of these documents are shown and quoted in the film. In their writings against Holly Collins, father’s rights groups cite Parental Alienation Syndrome, which means that a mother is trying to alienate her children from their father. Though it is not accepted as a legitimate diagnosis by the American Medical Association or the American Psychological Association (the psychologist who first wrote about PAS had conducted no actual studies), in family court it is often used to legitimize giving custody to an abusive parent. As Nolan puts it, “these are people who do not and will not respond to evidence, or facts, or medical records, or court transcripts, or expert testimony if it does not fit their preconceived notions.” The groups say that Holly fabricated the evidence of her husband’s abuse, but in reality false allegations of abuse are very rare. “Holly may not be perfect, but she was clearly a battered woman who only wanted to protect her children from abuse,” Professor Waller affirmed. Many years after their mother kidnapped them, the Collins kids, now adults, are healthy and grateful for everything their mother has done for them. Jennifer Collins, Holly’s oldest daughter, is the executive director of Courageous Kids, an organization for young adults who suffered from court injustice as children to speak out and share their stories. 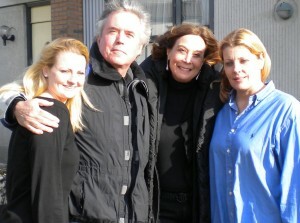 For more information about the film, go to http://www.nowayoutbutone.com/index.html. Our hope for the future is that domestic violence and child abuse victims will be heard. Thank you to Garland Waller and Holly Collins who have shed a bright shining light on the dirty little secrets of family court. They roughly estimate that 58,000 children each year are sent to live with and abuser by court ordered abuse. We will never give up, shut up or go away until we have resolved these human rights violations. Garland Waller is confused about the existence and credibility of Parental Alienation Syndrome. (PAS). Whether PAS is recognized and a bonafide disorder by the APA iand its Diagnostic and Statictical Manual V is a moot point. Just as the use of cigarettes killed long before all the detractors were silenced and the evidence to became widely known, the evidence of PAS and the behavior of its detractors is similar. All I have to do is ask myself. My own daughter is alienated from me and for the past nineteen years I have waited to work to repair our relationship. She is 25 now. One of the groups not unlike the mentioned Courageous Kids, Justice for Children (JFC) threw two lawyers from Fulbright and Jaworski, Llp at me and returned my daughter ( 6 1/2) because of a LIE, to her diabolical and alienating mother. I have tried to live with the reality of PAS ever since. Its real folks. And I support Fathers and Families. It is not a gender biased group as Waller would have the reader believe but one doing the very work she rails against, e.g. gender bias in the family courts. Boy do you sound biased. The fact that PAS is critiqued for having no scientific basis whatsoever is extremely relevant. It’s not in the DSM V because over half of the people who decided what would and wouldn’t be included in the Manual didn’t think it was based on any scientific fact. If you watched the documentary and looked at the facts, you would see that the children were genuinely scared of their father because he regularly abused them. They didn’t experience ‘PAS’, they experienced fear from a sadistic father. Start your post with an ad hominem attack claiming anger, bias or misogyny. Standard feminist operating procedure. Given that PAS has actually passed both legal standards for being recognized as medically viable in court suggests otherwise. As for including it in the DSM, you do realize the last time it was updated was 1994? 17 years of study has passed since it last got updated. You can’t use PAS’s exclusion from 17 years ago to try and debunk it today. As to watching the documentary… it is purely from Holly Collin’s perspective. It is nothing more than her telling of the events, not anything factual. here is an analysis of the trial, including links to the ACTUAL COURT DOCUMENTS. Of course, I’m willing to bet that you would rather believe that 7 court judges, numerous doctors, psychiatrists, child welfare workers and Holly Collin’s own mother, brother and sister all have it wrong, then to acknowledge that, maybe, just maybe, this woman is a miserable hateful woman who manipulated your emotions. First, he *is* biased because he has a child who has been taken away from him. He blames the child’s mother and is a fan of Fathers and Families. That’s bias. Secondly, I said that PAS wasn’t accepted into the DSM V, not IV. The DSM V is coming out in less than two years and over half of the psychologists and doctors who decide what goes in rejected PAS from the manual because (as I said) it is based on no scientific fact. Lawyers can twist around whatever they want to, but PAS has still never been proven to be scientifically sound. The documentary is from Holly’s perspective, yes. But that’s because her ex-husband denied to talk to the filmmakers after their numerous attempts to interview him. If he wanted his story told, why didn’t he speak up? I was sitting in the theater when the movie was being showed. Both Jennifer and Holly cried at numerous parts of the film. You don’t fake that kind of emotion – there’s no reason to do so in dark theater where no one else can see you. The site you linked to is ridiculous. It makes truly outrageous, stupid statements. ‘Holly Collins definitely wasn’t assaulted by Mark when she dropped off her kids because there’s no physical proof’ – oh, because all sexual assaults leave physical proof. Because when someone is being victimized and abused the first thing they do is film their abuse and show it to the world. Obviously. You are so right Robert. It breaks my heart the constant, mothers rights vs fathers rights. It should be about the child’s rights and each case judged on its own merit. There is no doubt in my mind that the family court system is a mess and just as there are physically abusive parents that unjustly receive custody of their children. There are psychologically abusive (alienating) parents that unjustly receive custody. My husbands children have been kept from him for 7 years. You are so right Angie. Unfortunately, it is not limited to family courts. Our entire judicial system is twisted. Asked all the African-American and Hispanic prisoners in federal and state prisons for possession of marijuana or other non-violent “crimes”. We have forgotten that people are rotten everywhere no matter how much money they may have or if they happen to be a prosecutor or cop who lies or withholds evidence that would show that a defendant is innocent. That is why my hope is in the young people and their sense of justice. I believe things can change and hope they will push for those changes as they move into adulthood. I am so happy that the Collins family made it out. I wish that post 9-11 there remained that only way out. Now even that one is closed. To many mothers and their children remain hostage to the pro pedo pro abusers court system. Thank you for getting this out. and RUN MOMMY RUN! The same is going on in Butte County, Ca. Our only minor’s counsel loves the men and does whatever she can to force the judges into ordering full custody to the fathers. It almost happened to me. I was in shock. Kim Merrifield lied about me, said I was unfit. I plan on calling an atty and seeing I can sue. That is one great accomplishment, lawyers are suing for kids when they turn 18, even though the courts said they cannot be sued. This “documentary” is based on a lie. Almost every piece of information contained in it is in direct contradiction to the actual court documents. Barry Nolan keeps spouting to anyone who will listen that they have proof yet they offer none. Glenn Sacks did a very good expose on all the falsehoods this case has generated and I encourage all of you to dig a little deeper and not take this at face value. There have been a few “fluff” pieces written on this trying to justify Holly Collins kidnapping of her children. Shes a criminal….not a heroine. The documentary tells us that batterers win custody in 70% of family court cases where abuse is involved. This is preposterous. Men don’t even win custody 20% of the time. Anybody who would believe all a man had to do to win custody is to batter his wife would believe the tripe about Holly Collins. She is not a hero. She is a kidnapper – among other things. She should go to jail for her crimes, not celebrated with a pity party as Professor Garland Waller and her husband Barry Nolan have done. This is clearly he said she said. The question then remains, why is the documentary presented from only one viewpoint ? Any kind of journalistic integrity would require feedback from the accused. The fact that no attempt was made to get input from the accused or the detailed basis of the legal rulings along the way show a clear motivation to whitewash the story. Shame. Spot on Patrick. 7 different judges ruled against this woman and many different mental health professionals as well testified she has “Munchausens by Proxy”. She would keep taking kids to the doctor over and over until she got someone to say what she wanted. Holly Collins has proven herself to be nothing but a lying and manipulative woman who will do, or say, or use anything (including her own children) to get what she wants. These lies that my father and his supports tell over and over again are infuriating. For years Glenn Sacks and Father’s and Families swore up and down that my brother’s skull was fractured at an amusement park. They called my mother a liar again and again. They said that if my brothers skull was not fractured in 1986 (when my father claimed) and it was in fact broken in 1987 (as my mother and brother insisted) it would be easy for me (my brother) to obtain all of the medical records and prove it. Okay… so I DID THAT! I proved that there was no way that my father was telling the truth because I posted the medical records from 1986 which clearly stated that x-rays were conducted and there were “NO BROKEN BONES”! I also posted the results from my brothers x-rays from 1987 which confirm his skull was fractured. It should have ended there. I proved my father and Glenn Sacks and Fathers & Families were all liars! Now it is happening again… Mike D. Glenn Sacks, Fathers & Families claim that MANY different mental health professionals testified that our mother had/has MSbP. That is a lie! This time the proof is on you! Only one person, ONE! Susan DeVries the family court custody evaluator said that she read 6 articles about MSbP and said that our case could fit some of the symptoms. She testified under oath that she was NOT familiar with MSbP, that she did NOT have the qualification for making such a diagnosis and that her only information came from rading 6 (SIX) articles. Are you kidding me? Judge Davis even retracted his findings the following week after he reversed custody and clarified that he never intended to diagnose my mother with any mental illness, especially MSbP. My father, Susan DeVries, Glenn Sacks and now Mike D (who cowardly refuses to come forward with his true identity) continue with further lies suggesting that my mother was a doctor shopper but the evidence already proves them wrong! When we moved to Massachusetts we had ONE pediatrician Dr. Louden. He referred us to a local allergist who was a grouchy old man. We saw him ONCE for ONE consultation and my mom was uncomfortable around him and told Dr. Louden. So Dr. Louden referred us to a pediatric allergist Dr. Polmar at the Boston Children’s Hospital. My father convinced Dr. Polmar that my mother was over reacting to our allergies and asked for some sort of other explanation. Dr. Polmar suggested that we could have dermographism, highly sensitive skin. What should this young mother do? She had TWO doctors who she trusted saying that her children were severely allergic and a new doctor saying that maybe her kids had some other medical disorder. She decided to get an independent evaluation at Tufts University who determined that our Doctors in Minnesota were correct! My pediatrician Dr. Vrouwenvelder and allergist Dr De Groot in The Netherlands have also confirmed our allergies. Dr. Vrouwenvelder personally witnessed me in anaphylactic shock. It is most remarkable that our mother tried everything to get us back and safe. She voluntarily submitted to several psychiatric evaluations to determine if she suffered from MSbP or any other mental illness. They all concluded that she did NOT! Thank God our mother was determined to protect us from all of my father’s abuse and sacrificed everything to protect us! It is bizarre how these angry men are claiming that they know what really happened to me and my brother because they read articles from Glenn Sacks who got his information from an abuser. They keep forgetting that my father was found to be an abuser! They are all supporting a known wife beater. That says a lot about their character! This documentary is just the first of many that will be coming out when the children who are being held hostage by the family court system finally get out and tell the world the horror of their childhoods. As a father of two who has suffered similar arbitrary court rulings, resulting in severance in our familial bonds solely because I refused to stipulate to false and malicious allegations, I can identify with how our court’s make judicial errors which ultimately destroy lives and deprive families from reunification. Our case went to the US Supreme Court twice, and both time the high court refused to hear our pleas, or review the orders that should have been reviewed in accordance to US and International Laws protecting children’s.families, constitutional and human rights. Today, I am sad to say that I ashamed to be an American, because everything that I believed in as a father and American, our Judicial System torn us apart and in the end of 10.5 years of litigation for family, constitutional and human rights, our nations court leaders failed us. Our only hope rests in International Law, within the treaties and charters that the US has ratified, which stand to protect our rights to fair hearings, an unbiased tribunal, and good governemnt that protects the rights of the family. Don’t fall for Lorraine Tipton’s fake sympathy, listen to what she really thinks about protective moms and DV advocates.. bashing Lundy Bancroft & Renee Beeker, a protective mom who was in a wheelchair & even Mothers of Lost Children… all while attending the BMCC! !